You’ve heard that oysters and chocolate are aphrodisiacs. 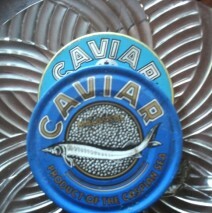 But the most luxurious of them all is Caviar. 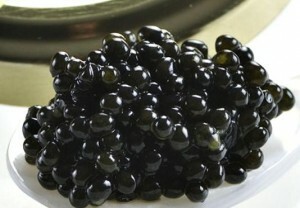 Besides being one of the world’s greatest symbols of luxury and a favorite of the elite, caviar earns its aphrodisiac reputation as a source for enhancing the libido. Though it may be a pricey indulgence, (Beluga, Russian Osetra, Imperial Golden Osetra, Iranian Sevruga) the paddlefish substitute and a vegetarian Cavi-Art is a sensual visual for an intimate Valentine’s Day garnish. Regarded as a lean protein – the aphrodisiac to sustain energy, with superior nutritional values with amino acid l-arginine, a vascular dilator which helps increase blood flow offers an essential ingredient for bedroom passion. The serving of caviar is nearly always a ceremonious event. 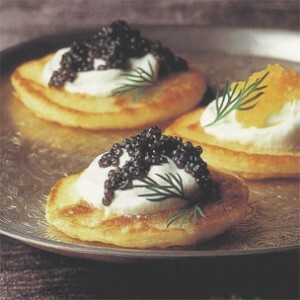 The Russian tradition of preparing caviar and blini is nearly tantric. It is also recommended that caviar be served at room temperature, not directly from the fridge. Some connoisseurs eat the fish eggs from a lover’s skin, typically on the hand at the meaty pat of the section between the thumb and fore finger. Whatever way you indulge in this luxury, you’ll enjoy the pleasure of this seductive seafood. Although blini are best served soon after they are prepared, they can be made up to a week in advance. Let them cool to room temperature, then freeze in an airtight container, first freezing them in a single layer on a sheet pan.. When ready to serve, place the frozen blini on a baking sheet and heat in a 200ºF oven until just warmed through, 15 to 20 minutes. To make the blini, sift together the buckwheat flour, all-purpose flour and salt into a bowl. In a small bowl, combine the yeast, the 3 Tbs. lukewarm water, 1 Tbs. of the sugar and 1/4 cup of the flour mixture; stir to mix well. Cover with plastic wrap and let stand in a warm place until bubbly, about 30 minutes. In a large bowl, whisk together milk, the 3/4 cup water, the eggs, butter. Stir in the yeast mixture and enough of the remaining flour mixture to make a batter. Using a cast iron blini [pan, brush pan with small amount of oil. If not available, place a large fry pan over medium heat and add about 1 tsp. vegetable oil. Tilt the pan to coat the bottom with the oil. When the oil is hot, using a tablespoon, drop the batter onto the pan to make a round 2 1/2 to 3 inches in diameter. Cook until bubbles appear on the surface, about 10 seconds. Turn and cook on the other side until light golden, 10 to 15 seconds more. Transfer to a warmed plate and keep warm while you cook the remaining batter. You should have a total of 3 dozen blinis. To serve, place the blini on a serving plate. Top each blini with small spoonful of sour cream, a tiny mound of caviar and chopped red onion (optional). Serves 6. Fill a small glass serving bowl with chipped ice, and set the tin of caviar on top. Serve the blini and accompaniments alongside.